One of the Virginia and Paul Smith’s largest—and most successful—initiatives was founding the Jordan Baptist School in 1974. Securing approval from the Southern Baptist Foreign Mission Board and finding land for the school buildings took many years, but the school’s survival was assured when the King of Jordan enrolled three of his daughters. 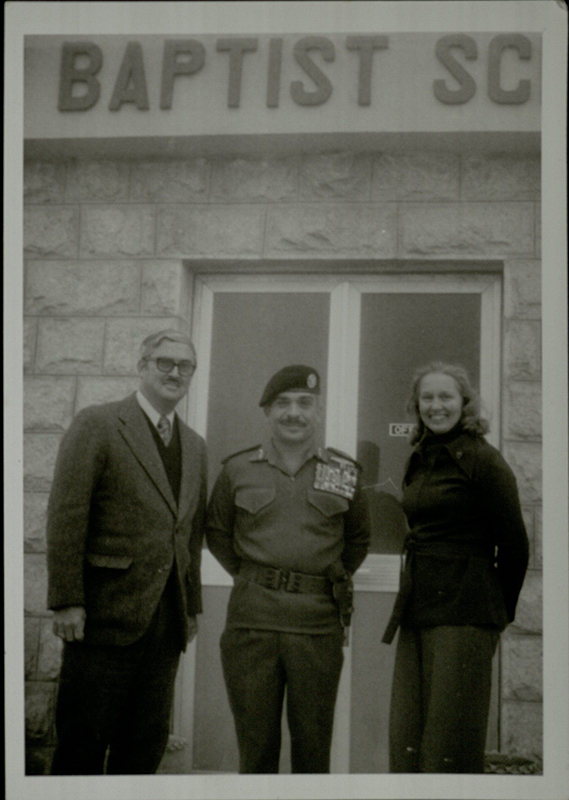 Here Virginia and Paul Smith greet King Hussein during his unannounced visit to the school. Virginia and Paul Smith Missions papers, 1955-2010, Accession 3953, box 1, folder 3, The Texas Collection, Baylor University. James and Peggy Bartley papers, 1951-1995 (#3952): Contains photographs and correspondence from and to Peggy and James Bartley, Southern Baptist missionaries in Uruguay, as well as an autobiography of James Bartley. Samuel Palmer Brooks papers, 1880-1937 (#91): Materials include correspondence, literary productions, collected publications, photographs, clippings, and other materials related to Brooks’ personal life and his role as Baylor University president from 1902-1931. Virginia and Paul Smith Missions papers, 1955-2010 (#3953): This collection describes the pastoral, educational, and humanitarian activities of two Southern Baptist missionaries that lived in the United States, Jordan, Saudi Arabia, Iraq, Morocco, and Lebanon. Materials include correspondence, photographs, and twenty years of Jordan Baptist Mission Board of Directors minutes. Every Baylor student has heard Brooks’ Immortal Message to the class of 1931 (“to you I hand the torch”). But as president, he gave many commencement addresses, many of which are in his papers. In this address to the class of 1915, one can see Brooks’ eloquence was not limited to the speech for which he is best known. Samuel Palmer Brooks papers, 1880-1937, Accession 91, box 30, folder 2. As Dean of Women at Baylor University, Lily Russell was involved in multiple aspects of female student life at Baylor and with Baptist women’s organizations. 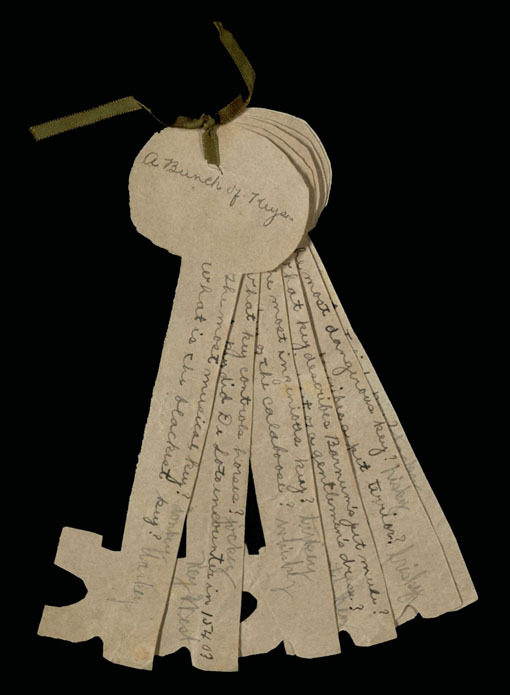 This “bunch of keys” is just one of many party materials in her records. 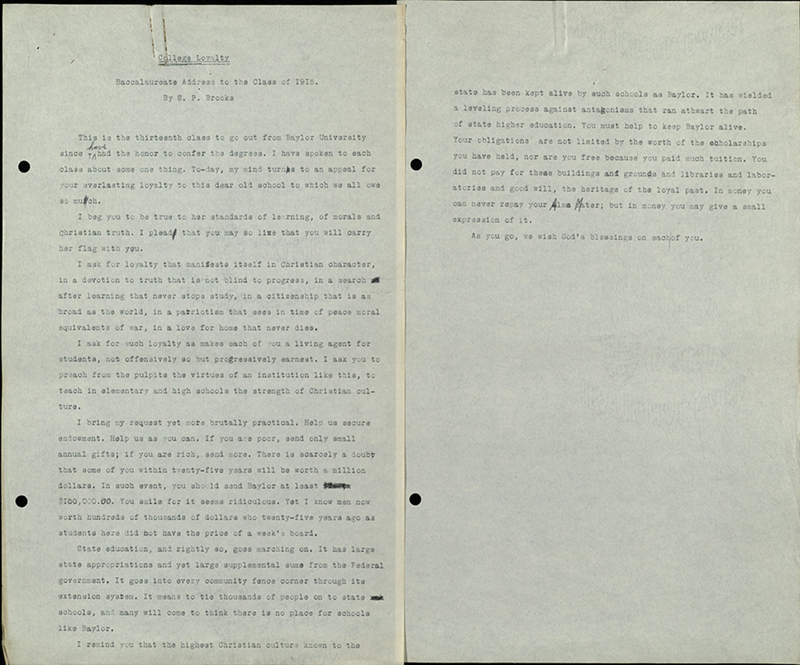 Catherine Alexander papers, 1871-1962, undated: Alexander was a widowed Southern Baptist missionary who became a benefactor to Baylor University. Her papers provide insight into the network of conservative Protestant missionaries sent out from the United States during the first half of the 20th century. BU Records: Calliopean Literary Society, 1885-1901, undated: Correspondence and literary manuscripts of the first female literary society at Baylor, founded at the Independence campus. BU Records: Dean of Women (Lily Russell), 1922-1969, undated: Records created and collected by Russell regarding her work as Assistant Dean of Women and Dean of Women at Baylor University and with various Baptist women’s organizations. 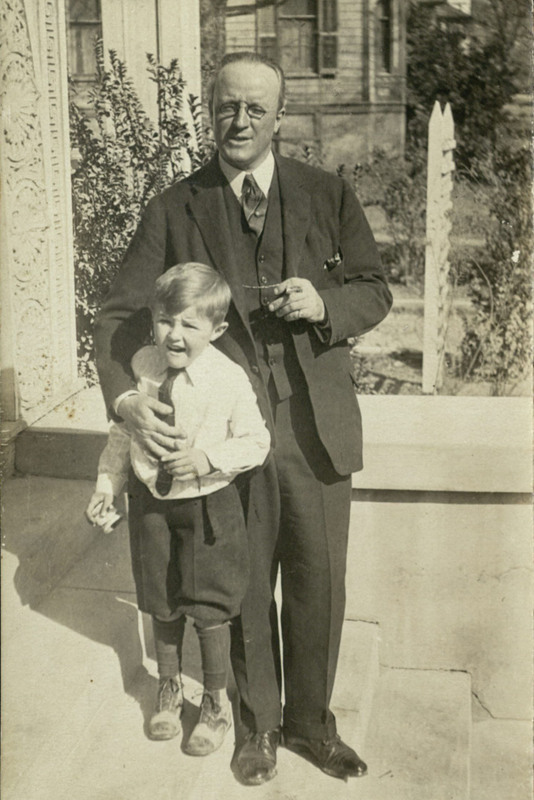 Dr. Carl Lovelace was part of many notable historical moments during his lifetime, including the W.C. Brann incident in Waco, Texas, Teddy Roosevelt’s Rough Riders, the Madeira-Mamoré Railroad construction project, and World War I.
Carl Lovelace papers, 1865-1969, undated: Correspondence, literary productions, photographic materials, and other documents relating to Dr. Lovelace’s life as a Rough Rider, doctor, and Baylor alumnus.